Imprint: Price includes a FREE 4-color process imprint on notepad and a 1-color pen imprint. Please see individual product pages for BIC Sticky Note pad and BIC pen specifications, including imprint areas. 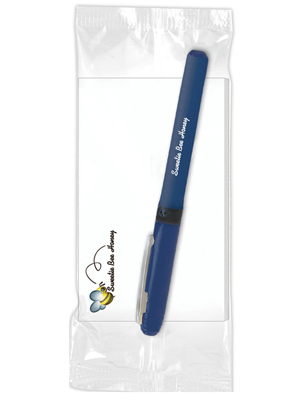 Due to different printing processes, the imprint colors on pens and notepads may vary slightly. Shipping: Catalog quantities ship in only 7-working-days! 2-day service at ground rates. BIC Air Express 1 Day Air. Since BIC Sticky Note products are heavy, please Click here for complete shipping information.